Deep dropping for snowy grouper is becoming more popular throughout Key West. Fishing for deep-water sea critters has long been a pastime in the region. Interest continues to grow for this exciting sport. Today, deep-sea charters like those of Captain Moe’s Lucky Fleet bring vacationers and experienced fishermen out on the ocean on a daily basis to snag some snowy grouper fishing time. Boats with longer range make finding grouper far easier, which is great because we have three well-maintained boats ready and waiting! The snowy grouper is a species of fish in the Serranidae family. 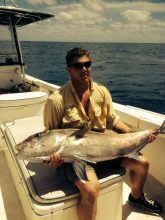 Anglers find this fish in the Gulf of Mexico and the Caribbean Sea, but fishermen in the Bahamas, Brazil, and Costa Rica report finding snowy grouper quite often as well. The larger members of the species generally begin to lose their white spots, which are commonly found on the side of this dark brown fish. A distinct black, saddle-shaped blotch tends to occur along the caudal peduncle and extends just below the lateral line. Anglers find the species in reefs and rocks, making the fight to score one a bit tricky for an inexperienced fisherman. Our crew will offer advice and techniques to bag a few, though! If you’re interested in snowy grouper fishing, you should know that we allow up to 6 anglers per fishing trip. The price includes everything you need, except food, water, and sunscreen. Make sure to bring plenty of water so you stay hydrated at sea. Our rates begin at $600 for 4 hours of light tackle fishing. They increase to $1,000 for 8 hours of offshore sports fishing. To schedule a snowy grouper fishing trip, contact Captain Moe’s Lucky Fleet by calling 305-304-8065. We will prepare your boat for the voyage of a lifetime!